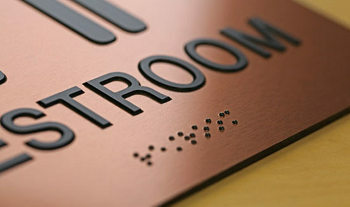 If you are interested in purchasing ADA compliant signs, then you have come to the right place. At Dollar Signs and Graphics we have been building and installing ADA signage for many years. We stock many styles of signs and even make custom braille and ADA signs for our customers in and around South Lake Tahoe. ADA Compliance in South Lake Tahoe has been a huge topic of discussion over the last few years. ADA compliance is a duty that all business owners should tackle as soon as possible to make all your customers feel welcome, cared for and safe. We can even install the signs for you.